On September 27, 2018, D.A.R.E. BC attended the Closing Ceremony dinner for the Across Canada 2018 bike ride, hosted by the E&E Global Foundation. Over a 10 week period during the summer, bikers road across Canada, from coast to coast. The ride started in Victoria, BC, and ended in St. John’s, Newfoundland. Bikers raised funds for several Canadian charities, supporting a diverse range of causes. 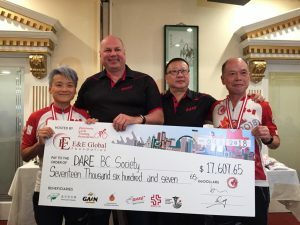 One of the riders was Esther Ho, a continuing member of D.A.R.E. BC’s Board of Directors. Esther nominated D.A.R.E. BC as one of the beneficiary organizations for the bike ride. During the ceremony, our President Mike Yau, Vice President Steve Ternes, and Esther Ho, accepted the donation on behalf of the D.A.R.E. BC Society. Throughout the 10 week period, over $17,000 was raised for the D.AR.E. program. We would like to thank all the riders, and the E&E Global Foundation, for hosting a successful event!